Why add our wedding dress services to a registry using MyRegistry.com? The expense of wedding dress cleaning and preservation is generally one that couples don’t think about until after the wedding and often after the budget is stretched thin. However, protecting your wedding dress investment is important. This program eliminates that concern. Why not have a kind friend or family member be a part of “preserving the memory” of your special day? Your wedding dress is sentimental and this service is a very special gift and opportunity for a caring friend or couple. What a lovely gift to be able to assist with the wedding dress! Nothing in the wedding is quite as sentimental as the gown and it’s a special feeling for a close friend to be able to help “preserve the memory”. We have split the pricing into multiple “segments”, so that a portion of the service is affordable to any friend or family member. This also permits a number of friends to assist with this special purchase to whatever degree they feel comfortable. Elegance Preserved is the premiere wedding dress preservation team in the United States. You can research our reviews on WeddingWire and The Knot. We have a free shipping service throughout the United States and coordinators ready to assist at anytime. You can call us at 800-539-9092 ext. 2 or email us at: bridal@elegancepreserved.com with any questions about our services or our gift registry. For more information on our services view our FAQs page at anytime! Link- Here. For more information on MyRegistry.com and why Elegance Preserved partnered with them, see the notes below the signup window. Why use a service like “myregistry.com” and as a customer do I need to sign-up thru the Elegance website? We have partnered with MyRegistry.com to provide an ultra convenient registry solution to all our brides. 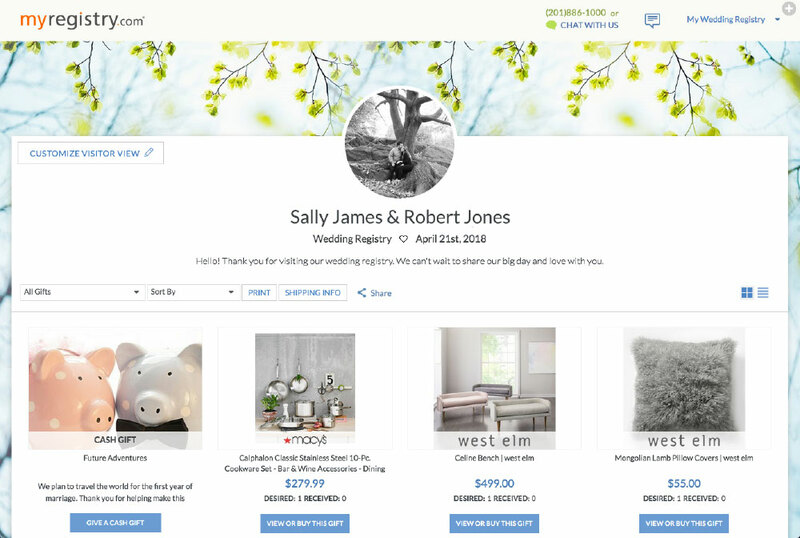 Brides may either create their registry by “starting at our website” and then directly adding our services (super convenient), or by starting at my registry.com and locating our services at that time.